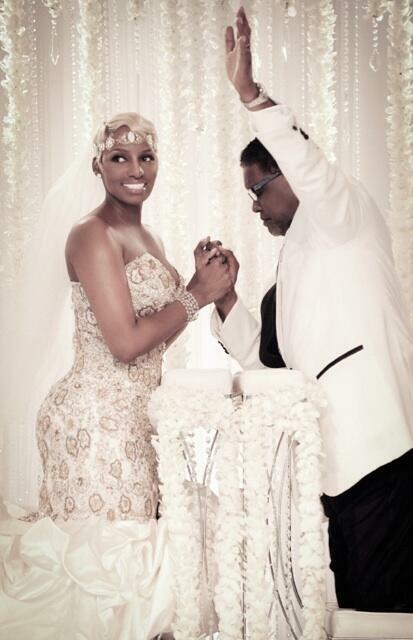 This past Saturday, NeNe Leakes married her ex-husband Greg Leakes for the second time. The couple was married 13 years before divorcing in 2011, only to get engaged again earlier this year. The extravagant ceremony was held at the Intercontinental Buckhead Atlanta Hotel, and it’s reported that the old Hollywood themed wedding cost around $1.8 million. Yesterday, the first official photos from inside the ceremony were released and we got a first look at NeNe’s $50,000 wedding dress. There’s also a photo of NeNe’s bridesmaids who were all dressed in white gowns designed by Gabriella Arango. New details about the reception have also emerged. The 400 wedding guests sat at tables with three-foot floral centerpieces and they dined on southern comfort foods, such as macaroni ‘n’ cheese, shrimp and grits, fried chicken and biscuits. For dessert, there was the 10-tier wedding cake that was filled will vanilla cream. Bravo cameras were there to record all the special moments for the upcoming series I Dream of NeNe: The Wedding, set to air this fall. 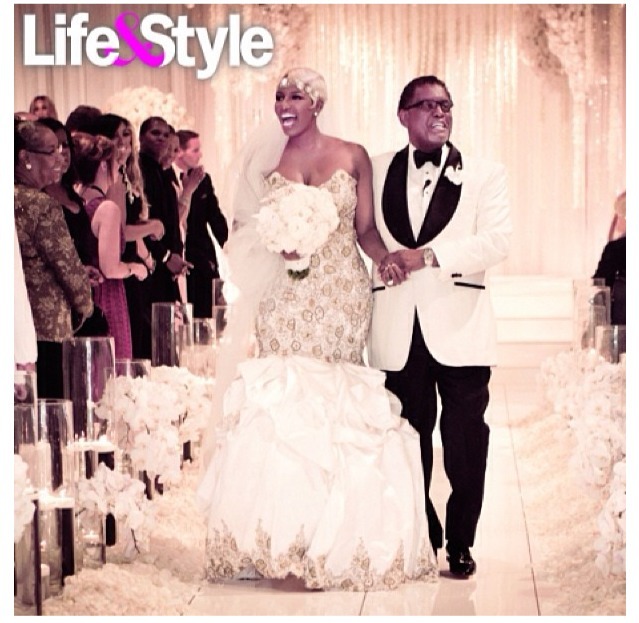 RHOA”s NeNe & Gregg Leakes Tie The Knot… Again! !